In their first interview since returning to America, all 23 members of the U.S. women's hockey team stop by the "The Ellen DeGeneres Show" to talk about winning their first Olympic gold medal in two decades after an epic shootout victory over their biggest rival, Team Canada. "I don't think it's truly sank in with us yet, it's been a pretty whirlwind journey. It was obviously an exciting Olympic for us and we are just so excited to get home and to share this experience with everyone that's supported us along the way," captain Meghan Duggan said. 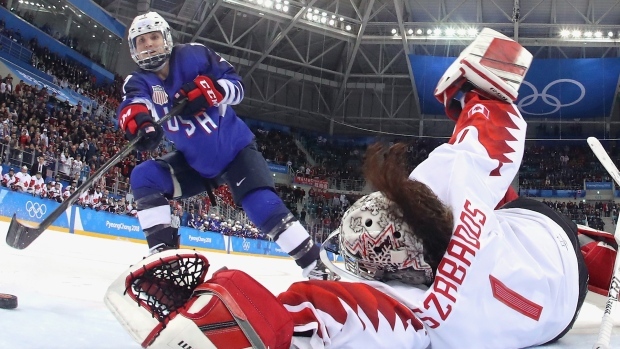 Goalie Maddie Rooney, whose final save won the game, revealed that during the high-pressure shootout, she was able to maintain her cool thanks to the support of her teammates who were cheering her on from the bench. Off the ice, the ladies were surprised to learn how famous DeGeneres is around the world. Forward Gigi Marvin said everyone around the Olympic Village was "freaking out" over the team's Ellen flag from the 2010 Games. Jocelyne Lamoureux-Davidson’s shoutout goal was the game-winner for Team USA in their gold-medal match against Canada. Here’s the meaning behind the unique name of the slick stick-handling move she used to put the puck in the net. "Uzbekistan, Finland, Kazakhstan, you name it, they knew you and loved you," Marvin said. DeGeneres praised the women’s national team for fighting for increased wages and equitable support from their sport’s governing body. Last year, the team threatened to boycott the world championships and Olympics if they "didn’t see some major cultural changes in our program in regards to women and being treated with a little more respect." "We are trying to motivate people through sport and inspire and continue the dialogue for equality," forward Hilary Knight said. "We needed to prove our worth too, and we came back with the gold, so we are pretty excited about that." The two sides reached an agreement just three days before the tournament began, avoiding a black eye for the sport. Before the agreement, players said they were paid $1,000 a month around the Olympics. The new contract is believed to be worth around $3,000 to $4,000 per player per month and some of the perks USA Hockey gives the men. The four-year agreement also pays players beyond just the six-month Olympic period. The ladies also presented DeGeneres with a hockey stick autographed by the entire team and an official Team USA hockey jersey. The host, never to be outdone in the gifting department, honored their win by hanging up the U.S. Women's Olympic Team jersey inside her studio. It is only the second time in her show's history that DeGeneres has paid tribute to a team by "retiring" its jersey. "There has only been one jersey hanging in this studio and that is Drew Brees from the Saints, and that's because I'm from New Orleans, I love Drew Brees, I love the Saints. But starting today, the U.S. women's hockey team is going to be hanging there," DeGeneres said as the team's shirt was hoisted above Brees' at the show's Burbank studio. For the first time since 1998, USA’s women’s hockey team won the Olympic gold medal.